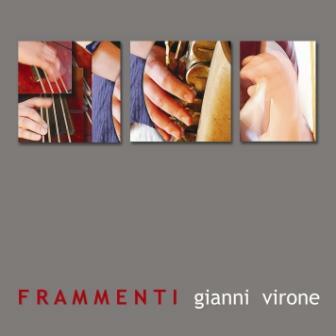 SR0908 - GIANNI VIRONE TRIO: "FRAMMENTI"
Frammenti ('fragments') is a peculiar work which deserves attention, no doubt. This music spreads an inner power and a modernity that being inside the border of Jazz language it allows to express fresh, original and surprising ideas. Peculiarity in the peculiarity, the graphics are a work of the painter Mery Rigo, here inspired by the musical life of the Trio. "All About Jazz - IT"
The idea to create this band started in 2003 right after a jam session where I had the luck to meet Mattia Barbieri. In that period I was already playing with another group with Davide Liberti and I decided to “put them together” and see what may have happened… This trio has been going on for a number of years thanks to the deep friendship among us and to the artistic affinity we discovered already at the first rehearsal. We all have more or less the same age and we live in the neighborhood of Turin and this surely helped our collaboration and the following work with other musicians. During these years I noticed that our music was gradually changing, rehearsal after rehearsal, gig after gig, following the experience and the evolution of the single members and consolidating a real ‘band sound’. The compositions were having every time a new shape because having a lot of improvisation and each musician has the freedom to bring the music towards many directions. In this way, each composition is simply a kind of “fragment”, a musical idea to develop, the subject of a conversation made with our instruments. From here, the idea to represent all this through the painting with the collaboration of Mery Rigo, outstanding Estractist painter, active on the domestic scene since many years. With Mery we had the idea to represent the musical process and improvisation of a jazz band through the fragmentation and the re-organization of images showing the band members during the performance. In this way we wanted to point out how the musicians participate in different ways to the development of the solos.